For the micro, small and medium enterprises (MSMEs), the backbone of both developing as well as developed nations, the challenge is how to promote these nearly 50 million MSMEs towards “Zero Defect Zero Effect” production. Interestingly, a significant proportion of these MSMEs are represented by their industry associations and Chambers of Commerce also called Business Membership Organizations (BMOs). 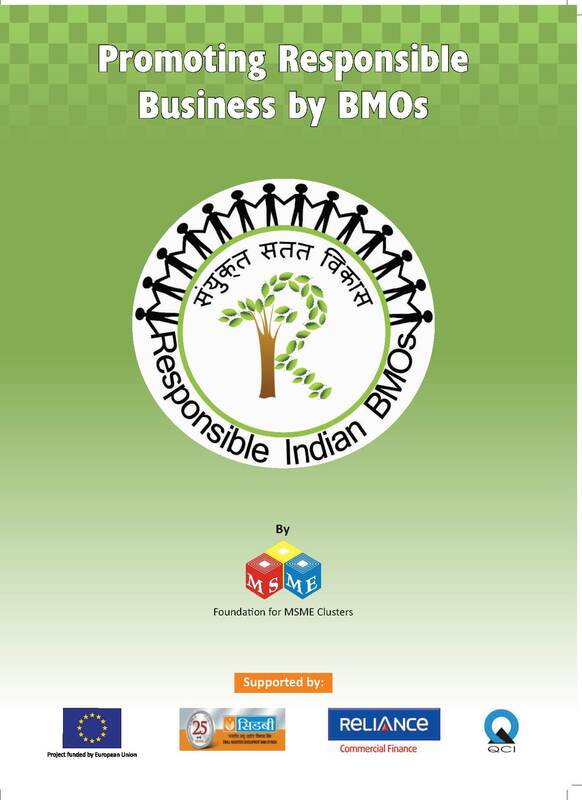 BMOs being the most trusted ally of MSMEs, are best suited to promote the concept of “Responsible Business” in a balanced manner among millions of MSMEs in India. This booklet has been prepared to (a) make micro and small enterprises (MSEs) better prepared to make them loan-fit and (b) make MSMEs aware about various financing schemes of the Banks and Government of India, and in particular detail the two most popular financing schemes (i) Credit Linked Capital Subsidy Scheme (CLCSS for foundry units) and (ii) Credit Guarantee Trust for Micro and Small Enterprises (CGTMSE). The booklet has been prepared as a part of the Project “Scaling up Sustainable Development of MSME Clusters in India”, being jointly implemented by Foundation for MSME Clusters (FMC), The Deutsche Gesellschaft für Internationale Zusammenarbeit (GIZ), Global Reporting Initiative (GRI), Indian Institute of Corporate Affairs (IICA), United Nations Industrial Development Organization (UNIDO) and Small Industries Development Bank of India (SIDBI) and partly funded by the EU Switch Asia Project. 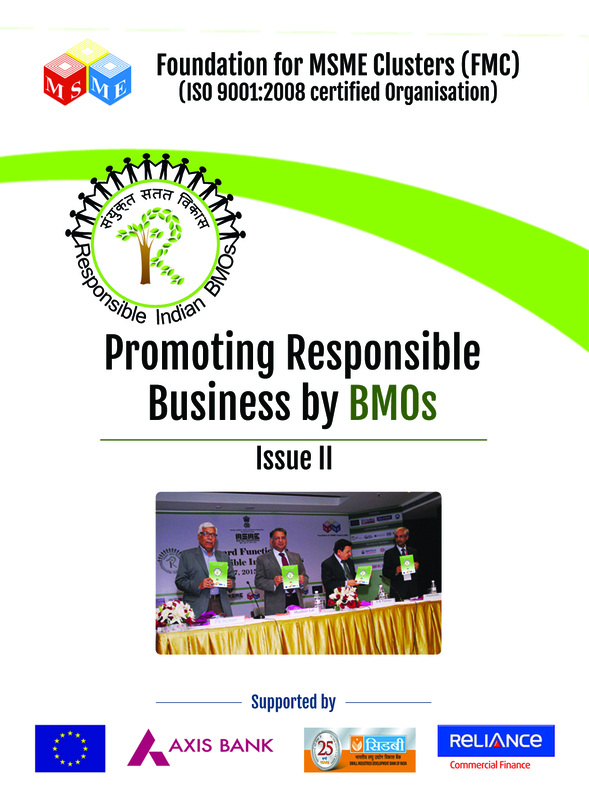 The Foundation for MSME Clusters being the premier organisation devoted to the cause of MSMEs and clusters, deemed it appropriate and timely to identify such BMOs that have made noteworthy contributions in the growth and development of MSMEs and therefore launched the “Awards for Responsible BMOs” programme and invited BMOs across the country to apply. The overwhelming numbers of applications received have been evaluated by an independent agency and the final selection of awardees has been made by eminent jury. An overview of the practice of competitiveness through cluster development approach. We begin by looking at some of the roots of the practice and how it has evolved to become a significant force in the way many organizations and many countries now pursue economic development. We then provide an overview of the practice of competitiveness, looking specifically at how cluster-based initiatives have been developed in the context of multilateral and regional organizations. 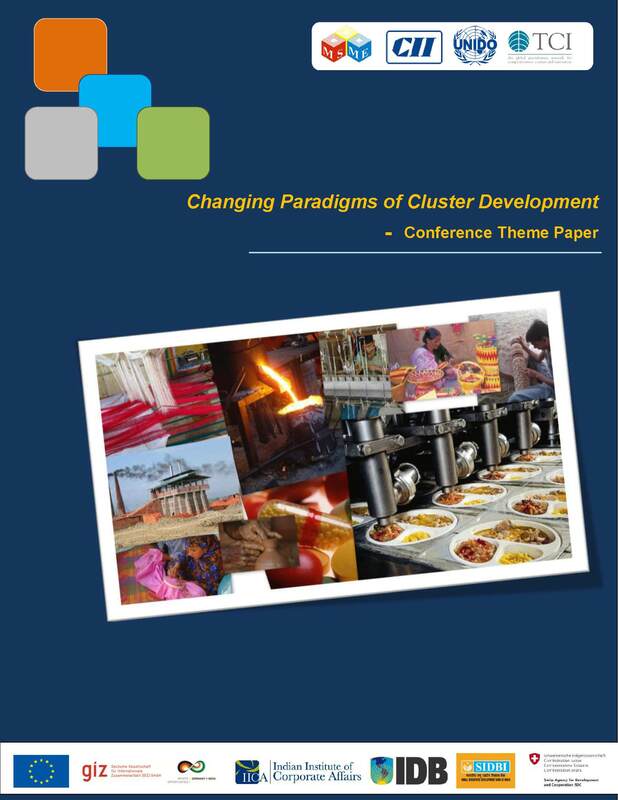 The study has captured ten successful international examples of cluster based branding and the learning that has relevance for Indian clusters and could be extended to other developing countries as well. Branding potential has also been analyzed in eleven national clusters. Possible role of policy and clsuter stakeholders for cluster based brand promotion is suggested based on the leaning from the international cases. 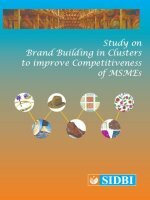 This book is an outcome of a study commissioned by SIDBI to FMC on cluster based branding.